All dog owners want their home to be a safe, entertaining and comfortable environment for their pooch to reside. Some dog owners are taking their puppy love to the next level by spending up big and installing dog-friendly amenities throughout their homes. Here are five luxury home upgrades to contemplate (and start saving for! ), so your best four-legged friend doesn’t have to ruff it. Give your pup the ultimate in freedom to come in and out of your home as they please by installing a smart doggie door. A microchip-triggered pet door will not only keep Fido happy, but keeps your home secure from unwanted animals and intruders, by only granting access when it reads the unique code on your pet’s unique microchip. SureFlap microchip pet doors cost about $250 each, which will be well worth it if one of your pet peeves is taking your dog outside to go to the loo early on a cold morning. Hello sleep-ins! Forget having your pet shiver under a cold garden hose or clogging up your bathtub drain with dog hair. Wash your pooch in the lap of luxury in their own custom-built dedicated dog bath or shower. If you’re planning on undertaking a laundry reno discuss with your builder and architect the possibility of including a custom-built dog grooming area if space allows. Don’t forget a hand-held hose fitting for ease of use, a niche to store dog shampoo, wall hooks for towels and collars, shelves for dog treats and brushes for extra pampering. If you have a larger or older dog, add in a step up to the tub to save you from heavy lifting. Every dog loves to have their own special space to chill out and have a snooze in. 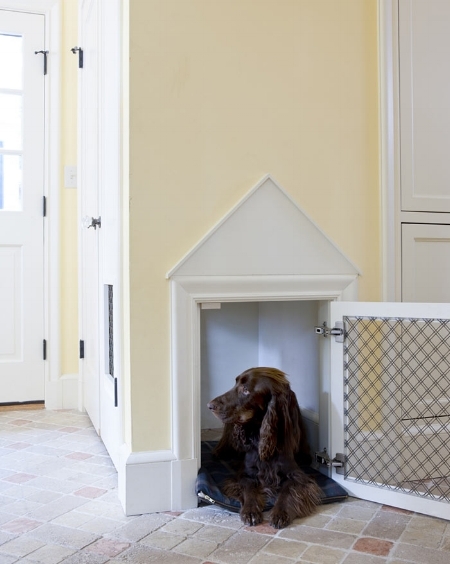 Why not consider adding in a built-in doggie day bed or doggie fort inside your home? Awkward corners, dead space in your kitchen island/cabinetry or under-utilised space under the stairs are all perfect opportunities to look at adding in a dog sized hideaway complete with dog bed, toys and cosy blankets. You can even get thermo heated pillows, leather dog-sized chesterfield couches, side tables with built in pet beds and custom designed dog bedding, to fit in with the rest of your décor. Bonus: A special luxurious bed or fort will also help to keep your puppy off of your furniture. Have you ever been confronted by a cranky and hungry pup when you get home late and you’ve missed their regular meal time? Avoid this scenario by investing in an automatic pet feeder. This way you can have peace of mind that your dog will have a full belly, even if you’re away from home for a whole day. Look for an automatic dog feeder where you can program multiple portion controlled meals in a day, to best suit your dog’s size and routine. Better yet, there are some models (like Petnet) that you can control remotely from an iOS smartphone, so your pet will never miss a meal again. The OxGord programmable dog feeder even has a voice recorder and speaker feature, so if you’re away from the house you can bond with and call out to your pet at dinner time. Undoubtedly dogs are full of energy and can just down right wreck your home and garden if they don’t get enough exercise. Enter the automatic fetch machine! If you’ve had an exhausting day at the office or you’re too busy to take your pup for a walk, set up iFetch inside or outdoors (there are three distance settings) and your dog will be entertained for hours of chasing and fetching. Plus, it’ll be good fun training them up to play. iFetch ball launchers start at $89.95. We hope these five ideas have inspired you to make your home that bit more homely and interesting for your furry friend. Are there any other ways you like to spoil your pup at home? Please tell us in the comments section. If you’re looking for a good place to live for pet owners, check out the most dog friendly suburbs in Australia. Using home utensils to do so much more than what you thought you could.